Local residents have been struggling for over a decade against an unsafe and environmentally unsound project which has been forced upon the community without their consent. Over €540 billion worth of oil and gas has been signed away by corrupt politicians in an unprecedented deal. The full resources and compliance of the State has been granted in shutting down protest and dissent in the area, at times resorting to extreme violence and brutality. 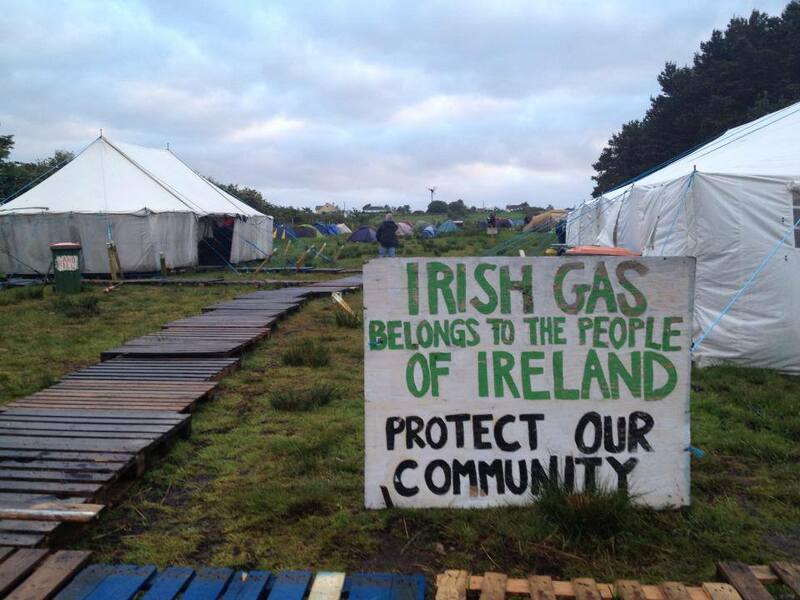 People of all shades of political background and none have gathered in Erris for the Week of Action against Shell, environmentalists, anarchists, republicans, socialists, hippies and punks, all united with the common purpose of stopping Shell’s destructive and dangerous profit-making project. The atmosphere in the camp has been relaxing and welcoming, and a huge amount of energy and enthusiasm for actions of all kind is present. 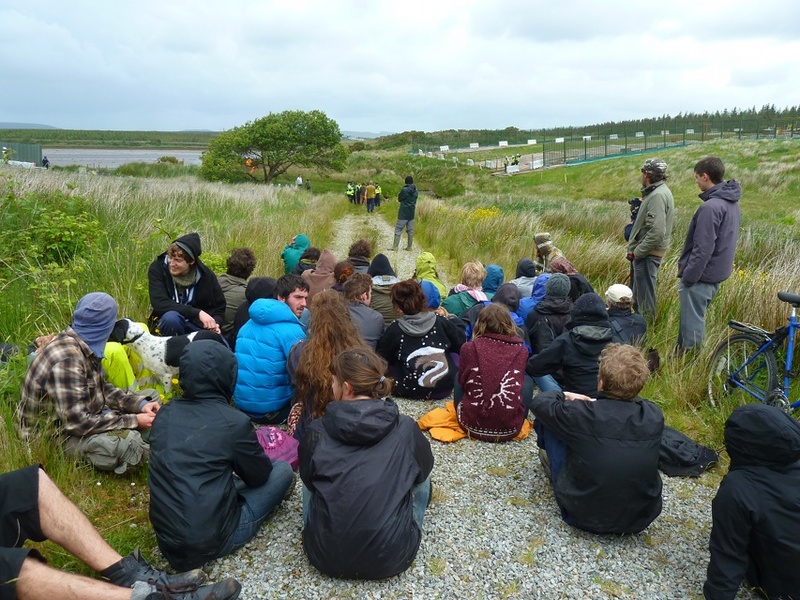 On Saturday 22nd June, local residents and activists from Rossport Solidarity Camp took part in a mass direct action against a road down by the estuary that Shell needs to move haulage trucks into the estuary for construction. Bog mats were uprooted and left to be reclaimed by the sea, and sandbags used to hold back the tide were slashed and emptied. IRMS, Shell’s private security mercenaries, were only able to look on helplessly in the face of mass direct action. 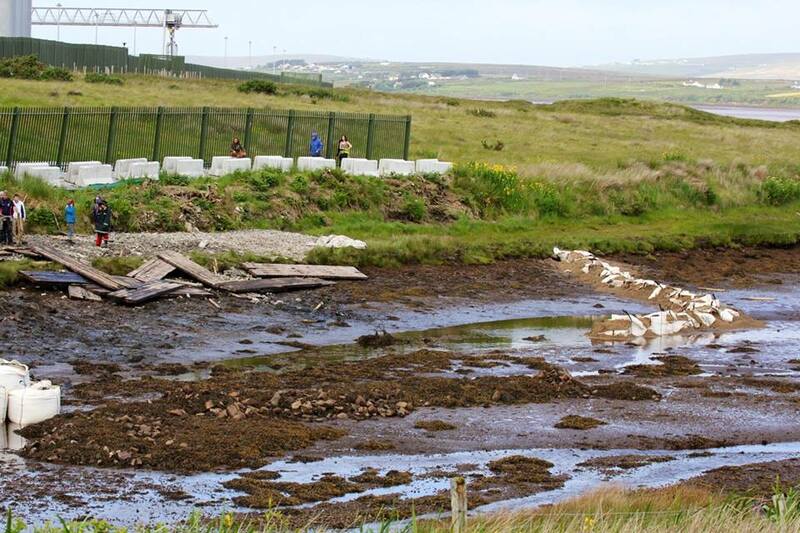 On Sunday 23rd June, around 80 people gathered in front of the Shell’s Aughoose compound to watch Donal Kelly’s one-man play about the situation in Erris, before returning to the estuary to finish the job of ripping up Shell’s bog road. Eventually local residents and activists breached the outer compound by ripping down a perimeter fence. Security attempted to push people back out of the compound, but unable to respond in the face of mass direct action, IRMS were forced into an ignominious retreat to the inner compound, leaving protesters to do as they wished. Later that night, Shell’s Aughoose compound was once again decorated with anti-Shell graffiti and a number of security cameras were taken out of action. On Monday 24th June, prosteters at the camp were taken on a tour of the Leenamore & Glengad compounds, enjoying the beautiful Mayo sunshine. A markedly increased number of police and security were observed on this day, including up to 35 Gardaí parked outside Aughoose Church, a few metres from the entrance to the camp, as well as officers from Special Branch. 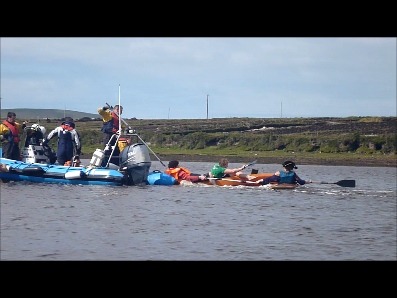 Six activists in kayaks also successfully disrupted work by Shell’s survey boat on Sruth Fhada Conn estuary. On Monday night, a house used by Shell to house engineers working on the project spontaneously self-destructed, and further actions against security and surveillance cameras took place. The week of action continues! People of all ages are welcome to come and join us at Rossport Solidarity Camp, Aughoose. A range of support work is also needed if you are not comfortable with potentially illegal direct action. The atmosphere in the camp is warm and welcoming, and every night is marked by music and fun events. Irish language classes have also been held, and people of all levels are welcome. 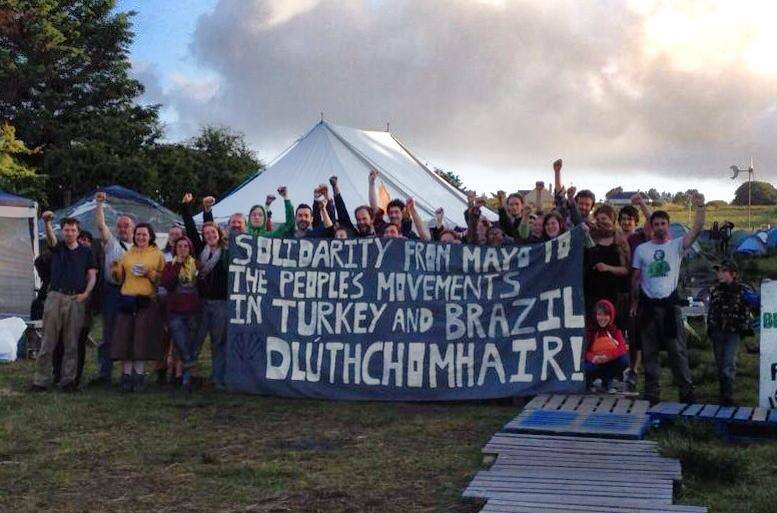 Join us in our resistance against Shell at Rossport Solidarity Camp!